I typically avoid salads. I’m not opposed, necessarily, to the idea of eating a bunch of uncooked vegetables mixed together, it’s just that I don’t care for lettuce. Yes, some varieties of lettuce are more flavorful than the basic iceberg lettuce, but at the end of the day I feel like I’m chewing water. Such a waste of my time. I actually remembered to take a picture of my food! I do, however, love both spinach and arugula, and I happily eat almost any salad with a spinach or arugula foundation. 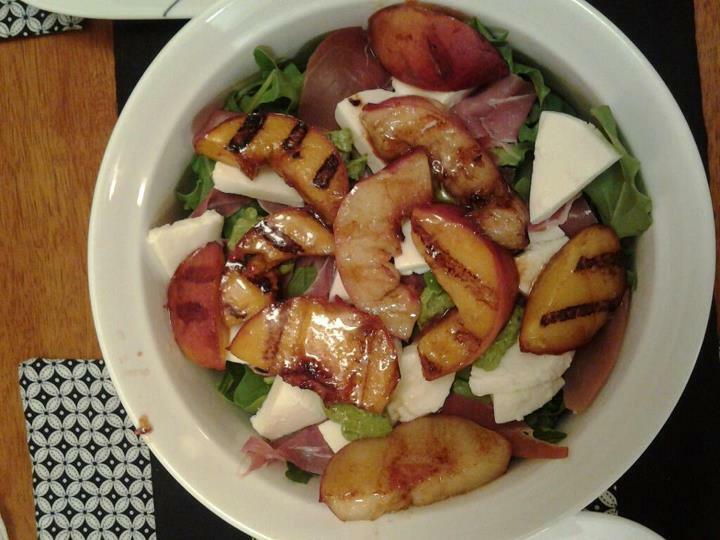 I found variations of this Balsamic Grilled Peach Salad on a couple different sites, and here’s my version. A wonderful summer salad for your table. 1. Place the arugula in a large salad bowl. 2. Combine the balsamic vinegar and olive oil in a medium sized bowl. Coat the peaches in the balsamic vinegar mixture. 2. Heat a grill pan or George Foreman-type device to medium high heat. 3. While the grill pan is heating, tear the prosciutto into bite size pieces. Scatter these on top of the arugula. 3. Place the peaches on the heated grill (save the balsamic vinegar mixture). Cook until grill marks appear, flip the peaches, and wait for grill marks to appear on the other side. This takes about 2 minutes per side. 4. Add the peaches to the salad bowl. 5. Pour the reserved balsamic vinegar and olive oil into a nice container; serve it on the side if anyone wants dressing for the salad. 6. In 10 or 15 minutes since you pulled out the ingredients, you’re all done! This entry was posted in Recipes and tagged 5 stars, gluten-free, side dish, vegetables. Bookmark the permalink.